According Research2Guidance Android now has about 5,00,000 successful submission. In 2011 Q3 the number of active mobile applications in the Android Market were at 3,19,161 compared to 4,59,589 in Apple App store. The numbers seem in favour of Apple however, the average publisher on Android has placed more than 6 applications in the Market since launch, compared to just over 4 apps on average that have been published by iOS developers. The total number of applications published on the Android Market has reached over 500,000 in September 2011while Apple has 600,000 successful submissions. 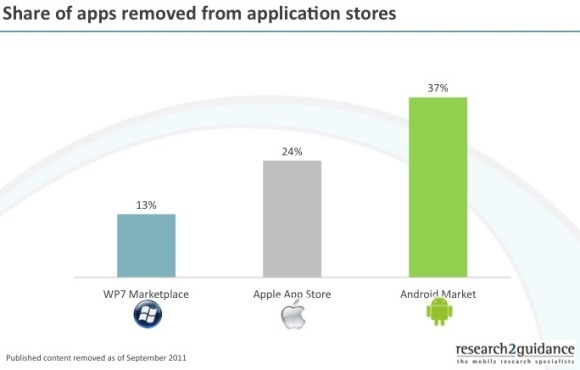 Over 37% of the applications published were later removed from the Android Market for some reasons, Apple App Store had removed just 24% of published apps and WP7 removed 17% of the total apps at the end of September.